Fifty kilometers can be a divisive distance in running circles. By American reckoning, it equals 31.07 miles. That’s roughly 5 miles more than a marathon and 19 miles less than 50 miles. Or, to put it another way, caught between limbo and no man’s land. However, thanks to the creativity of Shalini Kovach, the race director of four ultra races held in and around St. Louis, Missouri, a new race experience was born in 2016. In cooperation with other RDs around the Midwest, she decided to link five 50k races together to move this quirky distance to the forefront and create a unique challenge called the 50K Mashup Series. 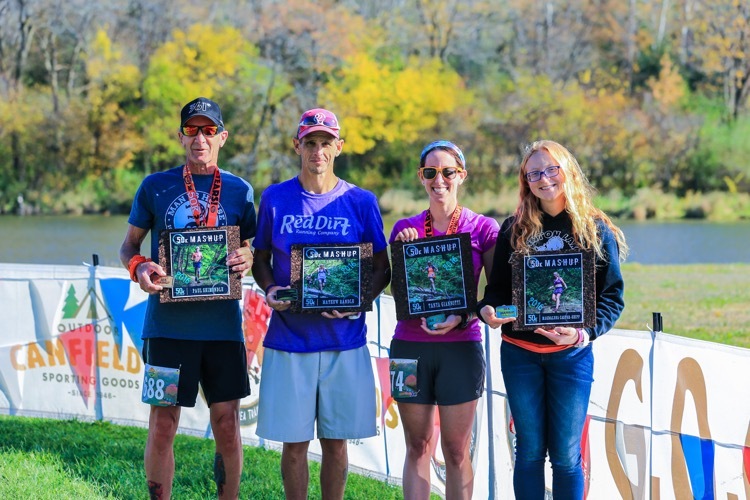 Participants were required to complete five of seven included races during the calendar year to receive a belt buckle as well as the chance to win awards given out to the top three male and top three female finishers based on their cumulative finish times for all races in the series. As a participant, I can tell you that each race had its own individual personality, terrain, weather conditions, and other tests and rewards. I’d run three of the races in previous years and jumped at the chance to be able to complete five. At least, it seemed liked a great idea at the time! Somewhere in Kansas, though, I wondered if maybe my thought process was flawed. #1 January – Frozen Gnome, Illinois. This is one of my favorite races every year. Veteran Acres and Stern Woods offer rolling terrain, flat open sections with bone-chilling wind and a few good hills. Plus, who doesn’t love subzero weather in January? The Gnome a great way to start off the New Year and run in some fresh, icy air. This is a loop course, so you get to come back through the start/finish area to the cheers of spectators, and after the race, the warming tent has plenty of soup and great stories in the air. #2 March – Clinton Lake, Illinois. I’ve run Clinton Lake numerous times, and that first hill before the single track into the woods is daunting on every loop. Clinton Lake is a very popular race and fills up fast, so if you’re planning on tackling the 50K Mashup, don’t dawdle on registering. The course is rolling hills and easy terrain, with a cool breeze usually coming off the lake. In March, the scenery is gorgeous. #3 April – Ozark Foothills, Missouri. The gnarliest terrain in the series. I think Shalini laid this course to test both the mental and physical endurance of the runners. It consists of great single track, hills, switchbacks, rocky terrain and a twist at the end. You head toward the finish line with music blaring, spectators cheering…and then the noise softens as you head into more switchbacks before actually coming to the finish line. It all adds to flair of this race. #4 July – Psycho Psummer, Kansas. OMG is all I can say about this one. Kansas in July? You have got to be kidding me! Back in January at the Gnome, my mantra was, “July and warm weather.” What was I thinking? Race day morning was 90+ with a heat index of 115 before we finished. Every loop saw fewer and fewer runners. Single track, hills, flat sections all bathed in hot Kansas heat. The aid stations had buckets of water that were available for cooling off the runners, which we took full advantage of. Definitely a race to test one’s determination and physical stamina. #5 October – G.O.A.T.z, Omaha, Nebraska. The 50K Mashup started out 14 strong, and we were now down to four competitors ready to toe the line on an absolutely perfect day for racing. The series chose the best for last. Course records and PRs would be broken in Omaha this day. The majority of the course was smooth, root- and rock-free single track. A stiff breeze met us on the backside of the lake. Three loops and we were done. I PR’d the course! Overall, this is a great series for anyone wanting to compete on a variety of terrain and weather conditions. It’s also an excellent training venue for those competing in longer ultras during the course of the year. The finishers all received a custom belt buckles along with an individual race photo/poster from Shalini. Job well done to all the RDs, volunteers and competitors.